Chicago building owners and managers wouldn’t wait for June to make plans for spring landscaping or December to plan for snow and ice. Yet still, many property managers wait to connect with a building restoration contractor until an actual property disaster hits – anything from plumbing malfunctions to electrical fires to sprinkler head discharges – all of which are not cyclical, seasonal or predictable. And as all building owners and managers know, the best way to combat unpredictability is with a plan. Waiting to identify a building restoration contractor: When Chicago was hit with flash floods in April, one building contractor had a post-storm waitlist of more than 800 flooded properties – some owned by strangers, and others that were regular clients and/or those that had reached out to prepare pre-disaster. Who would you help first? Blind dates with contractors: After you identify a restoration contractor, make sure you personally meet and interview them. Having a contractor that you’ve never met, spoken to or reviewed the emergency protocol process with, will lead to added headaches in a crisis situation. No paperwork on file: In an emergency, you may not have the time to verify your contractor’s insurance coverage and you definitely won’t have ample time to make changes or updates. Make sure you have a proper contract drawn up in advance. 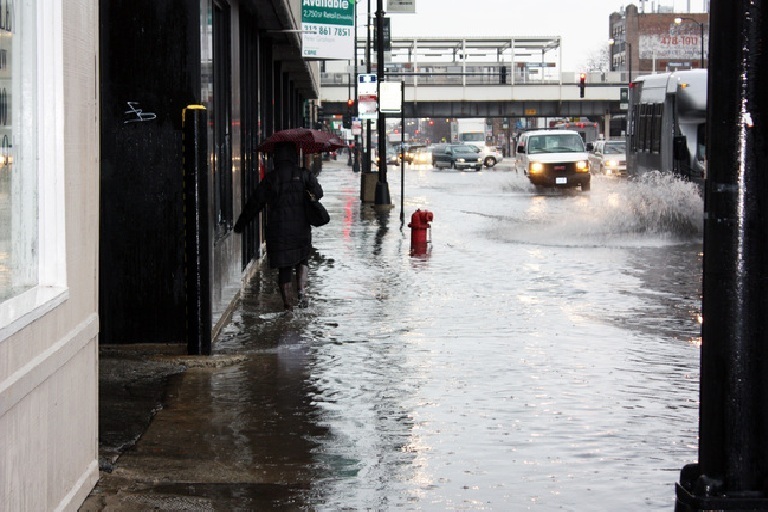 When Chicago was hit with flash floods in April (pictured), some property managers were left scrambling to find a suitable building restoration company. Know your resources: There are a multitude of tools and resources available for building managers to review contractors, which is helpful to determine who has been endorsed by your peers and who falls short of expectations. Consider checking the Better Business Bureau or customer review sites such as Yelp. Make sure to verify all recommendations by scheduling your own meetings, which will allow you to assess the company’s readiness and ensure they’ll be adequately responsive to your emergency needs. Set expectations: State your commitment to using a contractor for future needs with an as-needed service agreement. This understanding will be reciprocated if/when the contractor needs to choose who to help first in a disaster. Agreements won’t and can’t guarantee immediate response, but as a sign of prior commitment, it will help in getting you the service you need, when you need it. Plan your paperwork: The goal is to have paperwork in place for all services that are critical to operations – such as a current certificate of insurance, restoration company contract, alternate site agreement, supplier agreement, additional security and housekeeping and maintenance staffing agreements. So with hot summer months around the corner, don’t wait for the air conditioning to fail before checking your HVAC system, and don’t wait to start preparing for the next potential disaster. Do you have any other emergency preparedness tips for other building managers? Please share in the comments. This entry was posted in Chicago CRE Industry, Property Management and tagged Better Business Bureau, building managers, building owners and managers know, Chicago building owners and managers, Chicago was hit with flash floods in April, property managers, Yelp. Bookmark the permalink.